Showing results for "lego harry potter quidditch"
He'll perfect his skills wearing this boys' Harry Potter graphic tee. In gray. Crewneck Short sleeves Hogwarts Quidditch design Fabric & Care Cotton, polyester Machine wash Imported Size: L(7). Color: Grey. Gender: Male. Age Group: Kids. Material: Cotton Blend. 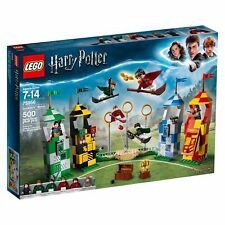 eBay Lego Harry Potter 4719 Quality Quidditch Supplies Factory Sealed New. Harry Potter Quidditch Robe, Medium Product Features Harry Potter Quidditch Robe, Medium Burgundy robe with Gryffindor emblem on front Front and back include the name Potter Product Description Rubie's Costume Company has designed quality costume and fun clothing for decades. Trusted to be the leader of cosplay, halloween, and general decor items, Rubie's does not sacrifice quality for price. Expect the highest in costume design and material with Rubie's. From the Manufacturer The deluxe robe is tailored with one yellow racing stripe down the sides of the arm and leg area. The costume features an emblem on the left chest and is laced together in the center of the chest.